To be a successful family owned and managed Dry Creek Valley winegrower using sustainable and innovative farming practices to ensure consistent, high quality wine grapes. At Tzabaco Rancho Vineyards, our mission is to provide exceptional wine grapes crafted from multiple clonal selections of proven Dry Creek Valley grown varieties for wineries looking to create superb wines while building strong relationships with our family, our land and our clients. Produce the best quality wine grapes possible…and maintain strong relationships within the winery community. Provide a wide selection of wine grape varietals….and clones within those varietals. Provide continuous family management while protecting our vineyard lands and conserving our natural resources. Provide a safe working environment for our employees and enhance the economic and social wellbeing of our employees. Maintain the longterm viability of agricultural lands….as we have done for over 150 years. 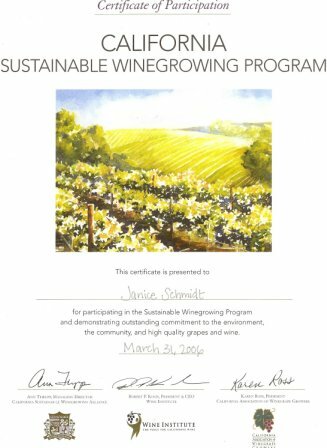 We have been part of the California Sustainable Winegrowing Program since 2006 and are committed to continuing our education about sustainability by reviewing our progress every year! New Video Highlights California Sustainable Winegrowing from Sustainable Winegrowing on Vimeo.